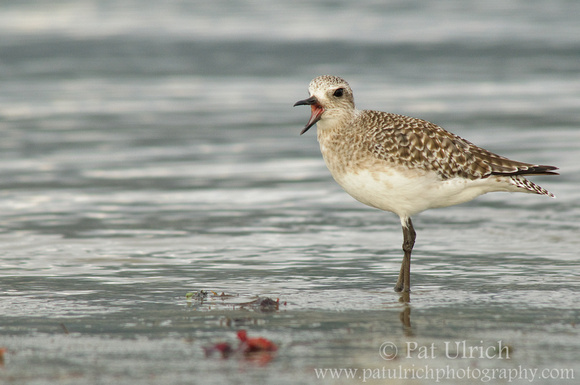 A plover (black-bellied, I believe) calling out along the exposed mudflats during a negative low tide at Pillar Point Harbor on Half Moon Bay. Our trip there on Saturday was a real treat, with a diversity of shorebirds on the flats and some nice tidepooling opportunities along the beach area. We even saw a baby octopus in one of the pools -- which I never would have noticed except for the courtesy of a family pointing it out. Also, I started this blog in October of 2009, and this post marks the 150th so far. Thanks to everyone who has taken the time to view what I've uploaded, and please do consider subscribing in your reader if you haven't already. Thanks! Thanks, Pescalune! I always enjoy seeing your shots as well! Love this image, the bird seems to have such a caracter!